Description: After installing FileSync between two or more servers, users may encounter an error when attempting to access the Overview tab of a realm from a Secondary server. Cause: The realm's web.config file is referencing a theme folder that's not present within the realm's file directory on the Secondary server. 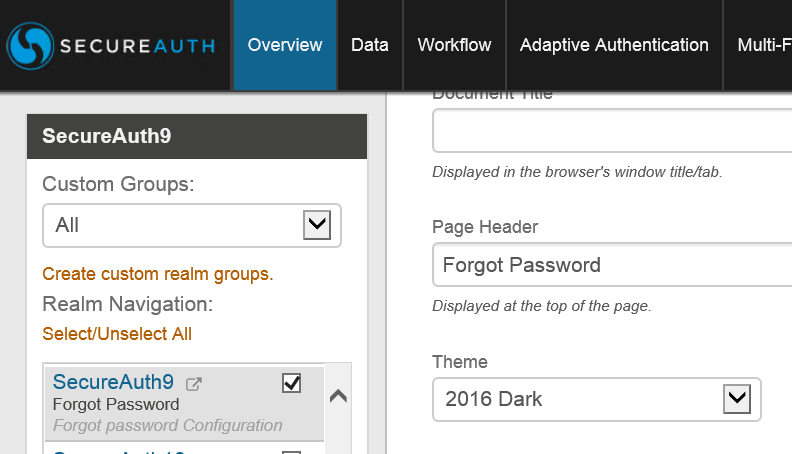 This can occur whenever custom themes are used on a SecureAuth realm. FileSync only synchronizes web.config and language files between severs. Because of this, all other files must be carried over manually--e.g. custom image files and theme folders. - From the Primary server, find the realm equivalent to where the issue is being witnessed on the Secondary server. Go to the Overview tab of that realm and see which theme folder is being referenced. - Copy the referenced Theme folder and paste it into the same exact file directory on Secondary Server. - You should now have access to that realm's Overview tab from the Secondary server.